While the US military continues to build more advanced Unmanned Aerial Vehicles (UAVs), popularly known as Drones, the US company Battelle has developed a anti-drone weapon to knock drones out of the sky without totally destroying them. 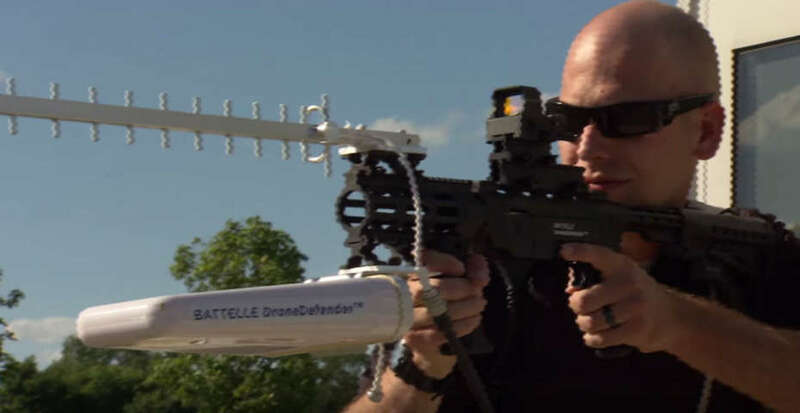 The Battelle anti-drone weapon DroneDefender is a thoroughly dystopian looking gun-type gadget that uses targeted radio pulses to neutralize in-flight drones and force them to land or hover. Despite its appearance, it’s not made to fire any projectile. Instead, the DroneDefender works by jamming the communications of commercial drones, causing them to lose control and, ideally, land. You can watch the video given below to know how the anti-drone weapon DroneDefender works. It shows how the weapon is able to stop a drone in its tracks and cause it to land. The DroneDefender weighs less than 10 pounds and can be mounted on any existing weapon with a picatinny rail—a fairly standard mount found on military rifles and can disable a hostile drone within a 400-meter radius. How Anti-Drone Weapon DroneDefender Works? As soon as the trigger is pulled, DroneDefender emits radio pulses that interrupt the communications system of the drone (both drone and GPS signal it sends out) and makes it think that it gone out of range, thereby preventing the drone from accepting any additional commands from its operator. The drone then enters into its safety protocols that force it to either hover in its position or slowly prepares to land, or return to its point of origin. It’s primary targets are small commercial drones flown in places the federal government doesn’t want them to be: the radio bands it uses to disrupt drone signals are restricted, so this isn’t a product for everyday consumers annoyed by their neighbors quadcopter. Not to mention the fact that currently, the cost hasn’t been publicized. Though other companies have tried to make drone-neutralizing devices before, this is the first device that is able to knock drones out of the sky without purposefully damaging it.Battelle is a major government contractor that helps manage some of the country’s national laboratories and regularly makes scientific breakthroughs and discoveries. Stamm noted that the DroneDefender would be useful for controlling drones over wildfires, public events, or other sensitive airspace. In several instances, police have attempted to force drones down with their helicopters or have interrupted pilots while they’re flying, which is usually more dangerous than asking them to bring a drone down safely. The DroneDefender could potentially provide a safer method of stopping a drone. The device can only be used by the federal government because the radio frequencies it uses are governed by the Federal Communications Commission. That means consumers probably won’t ever be able to buy a DroneDefender, either.